I ran a poll recently on Twitter asking what post you wanted to see next: summer accessories, a Disney travel journal, or 4th of July outfits. Most people, it seemed, wanted summer accessories. My husband helped me with this by making (surprisingly helpful) suggestions. Without further ado, here are 5 practical, affordable accessories for this summer. I love flamingoes, so I'm really excited they're still on-trend this summer. This pin is perfect for sprucing up a plain t-shirt or tank top, or adding to a collection on your denim jacket, bag, or hat. Summery, sweet, and simple. And only $3.50! Being hydrated is important year round, but this water bottle, at a hyper affordable $11.50, is perfect for the summer time. Over the past few months I've become obsessed with cactus print (as has the rest of the world) so this really hits the spot. 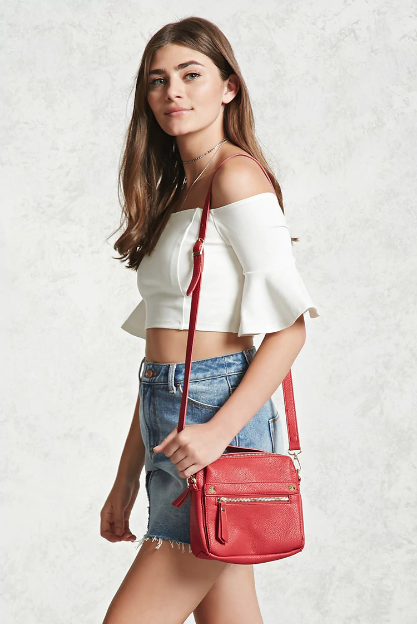 I love a cross body bag for vacations and this one is really perfect. It's big enough to carry a small wallet and your phone, plus sun screen, lip balm, and other accessories. But not so big that you feel like you're toting around half your house. It's available in 3 colors, but I love this dark, rusty red. At $18, it's the perfect price for the summer. Baseball hats are in this summer. This one from Maurices is particularly cute. I'm a sucker for floral print, what can I say? And at $12.50, you can get in on the trend without committing to something more expensive. "Everyone needs a phone case," my husband said. He's not wrong. I love getting new, fun phone cases and Forever 21 always has so many options. I love this one for the 4th of July; it's cheeky, summery, and fun without being "bald eagle crying on a mountain top" over-the-top Americana. And at $7.90 you can throw a few others in your cart too.